Although cloud solutions usually cater to businesses – who are keen on saving as much as they can – such service providers know that everyday users are also interested in such innovative solutions, especially if it means using a service that comes with unbeatable prices and a wide variety of business-grade features. It’s not surprising, then, that Vonage, a virtual phone system provider that’s been on the market since the early 2000s, is considered by many residential users to be a top cloud phone solution. From the first moment you subscribe to Vonage, you’ll see how the company aims to cater to the needs of each of its clients. No matter which pricing plan is selected, Vonage provides all of its features without limitations, so even residential users can take and make calls like small business owners. Vonage residential users have access to a wide range of call handling features, some of which are on par with those available for business cloud phone subscribers. Although call forwarding is a basic feature that provides the option to automatically transfer a call to a selected number should the network be temporarily down, Vonage also includes an advanced version of this well-known feature, known as ‘call hunt’. This is basically the same as call forwarding, but it can call up to five different phone numbers in a sequential order – albeit only if you possess at least two phone lines. However, there is the option to replace call forwarding with SimulRing, which is exactly how it sounds by simultaneously calling five different phone numbers. Additionally, incoming calls can be transferred to any phone number within the U.S. without paying an extra, put into call waiting, and even get returned to the original number should the requested transfer fail. Thanks to call blocking the system won’t allow unwanted callers to reach you, regardless of whether the call originated from a local number, directory assistance or from an international location. Additionally, the do not disturb feature will take care of everything for you as well, by automatically forwarding all calls to voicemail within any given period of time. With the exception of anonymous calls – that are immediately declined to begin with – all caller IDs are properly displayed, whereas your own caller ID can be kept hidden. There are a few interesting features regarding incoming calls, too. The option to merge two incoming calls into a three-way conference call and being able to make in-network calls for free is nothing particular; what is of particular note, however, is the so-called Vonage access number option. 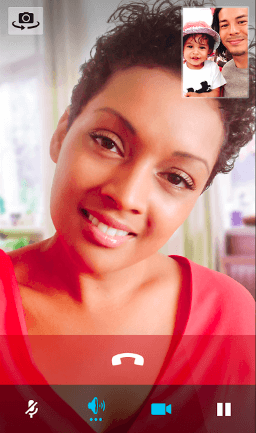 Calling the access number followed by your own Vonage number will enable the caller to connect with you for the price of a local call, which is especially helpful if the call is placed from abroad. And as for the quality of calls, rest assured that Vonage provides crystal clear calls at all times thanks to its bandwidth saver, with which the call quality is kept top-notch even with problematic internet connections. Although the online system manager looks rather primitive and unappealing, it perfectly serves its primary function thanks to its straightforward design. Naturally this is the place for managing every aspect of call handling, SimulRing and call hunt to call blocking and call waiting. But when it comes to call forwarding and SimulRing, the manager doesn’t actually allow them to work in tandem, which means that only one of them can be active at the same time – just as should be the case. 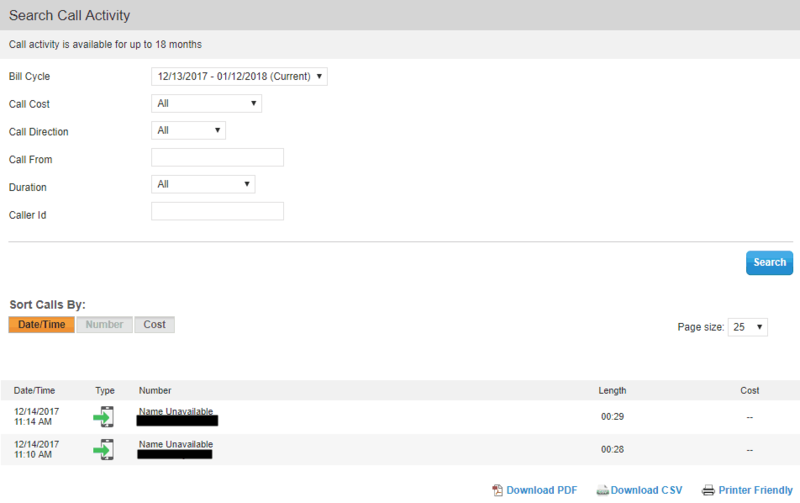 But the system manager isn’t just a platform to manage call handling, it also stores transcribed voicemails with their respective .MP3 recordings and displays a log of all previous calls – outbound and inbound alike – in a simplistic and understandable manner, with the added option of being able to search for specific calls. Additionally, the online account is capable of handling settings for the phone adapter, the mobile phones that can serve as extensions to the system and allows the addition of others to the system later on. Such extras include the softphone and additional phone lines, whether that’s a virtual international number, a toll-free number, a fax line or just another secondary local number. All of these add-ons can easily be ordered and added from within the manager without leaving its confines for a second, made all the more efficient due to the fact that all the necessary information about you – such as address, payment information and a complete profile – are already stored within your account. 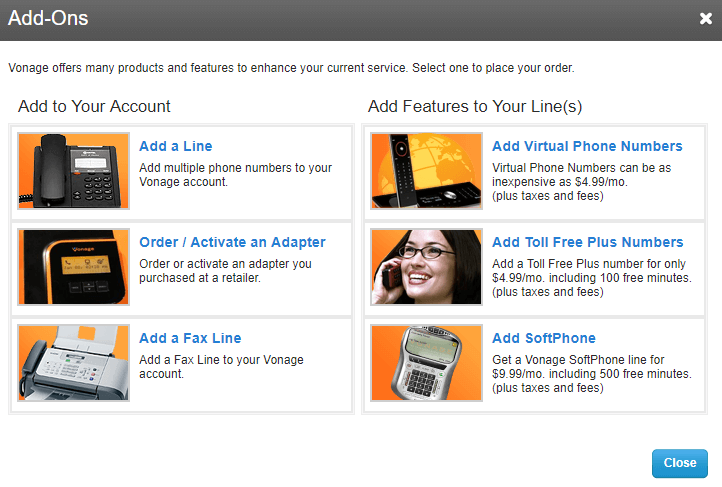 There are many extras that can be added to a Vonage subscription, including two mobile apps (which we will discuss later), boomerang, the option to send and receive faxes, and the installation and use of a third party softphone. Sadly, neither the softphone nor faxing are included as part of any Vonage plan; both come at an extra cost of $9.99 each month. However, these offers are quite generous: with the softphone it’s possible to place and receive 500 minutes of free calls, while faxing allows for 250 minutes of outbound faxing and an unlimited number of incoming fax messages. 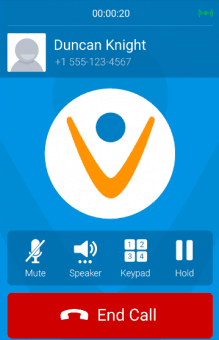 Still, the most interesting feature – which does come for free via the Vonage Home Extensions app – is boomerang, a real life-saver for international callers. Its working principle is so simple that it’s ingenious: the international caller calls your number and the system automatically returns it, essentially meaning that the caller doesn’t need to pay a single a dime for placing a call to an international phone number. By default, each new Vonage account receives a local phone number generated automatically by the company. 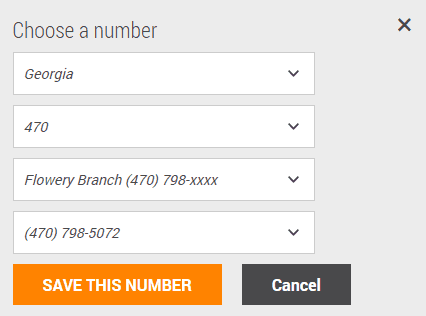 However, this number can be replaced by another local phone number or a number ported from another provider. 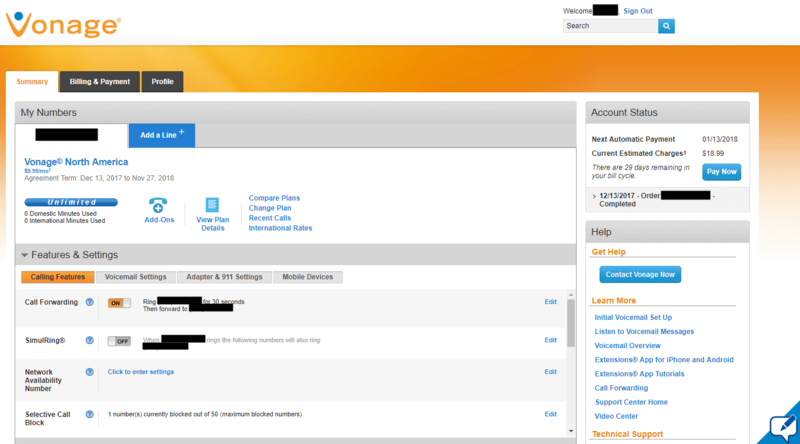 Note, however, that Vonage requires an additional ten business days to complete the number transfer. 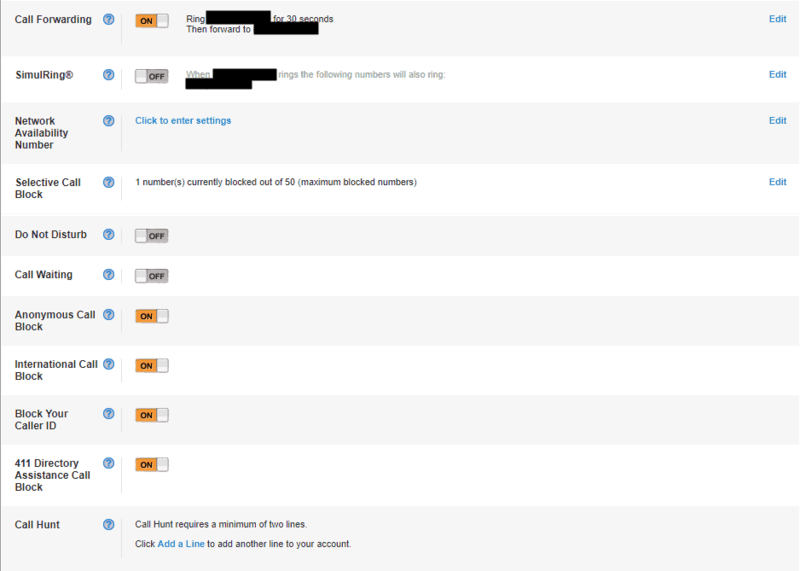 Due to the fact that all Vonage subscriptions come with one phone line by default, all additional local numbers are treated like new subscriptions. This means that just like regular subscriptions, only the initial period is available for a reduced price of $9.99 per month, after this the price increases significantly to match the level of your monthly plan. Additionally, purchasing extra phone lines is the only way to get access to a toll-free number or an international virtual number. The former is $9.99 for the first 100 minutes, while the latter is either $4.99 per month or $9.99 per month, depending on where the virtual is set location. Vonage provides two distinct apps for iOS and Android devices. The first is Vonage Home Extensions, which is capable of turning two mobile phones into virtual extensions in order to be able to place and receive calls while on the go. This means that regular mobile calls can effectively be separated from incoming Vonage calls, not to mention the fact that it allows for the option to place calls to any phone number and pay only the reduced call rates of Vonage. 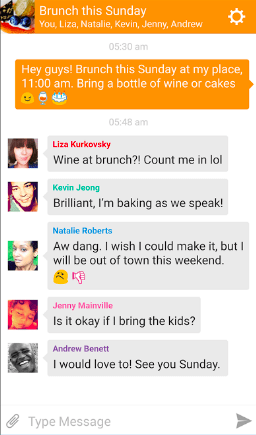 The other app, Vonage Mobile, is basically a slightly advanced version of instant messaging apps like Skype or Facebook Messenger. 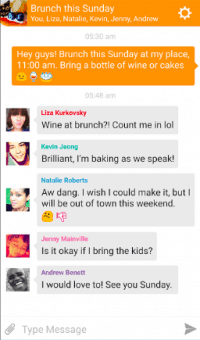 Within this app Vonage Mobile users are able to chat, initiate voice or video calls and even share files over the internet without paying anything. 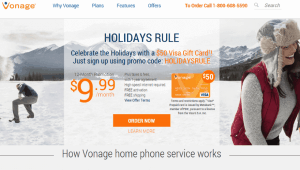 However, by purchasing credit – which has to be created separately from within the regular Vonage account – users can enjoy the low call rates that Vonage subscriptions come with. Although Vonage does have plans specific for business users, residential customers are offered a greater variety regarding pricing plans. And to make things even better, every subscription plan includes all the same features provided by Vonage, as well as a sweet 30-day trial via its risk-free money back guarantee. The two cheapest plans are Vonage North America and World, both of which cost $9.99 per month with a one-year contract. However, Vonage North America only allows unlimited calls to U.S., Canadian, Mexican, and Puerto Rican phone numbers, while Vonage World provides unlimited calls to up to 60 countries. The biggest key difference between the two plans, though, is the pricing. 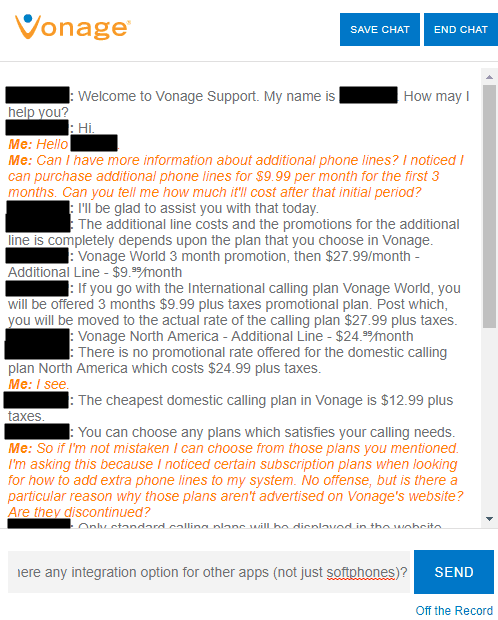 Vonage North America costs $24.99 per month, and locks in reduced prices for the first year of use, while Vonage World – which normally costs $27.99 per month – has cheaper rates for only the first six months. Additionally, newcomers can opt for Vonage US & Canada 400, which is $12.99 per month with or without contractual obligations and provides 400 free minutes to American and Puerto Rican numbers. The other option is Vonage 3000 to Globe Philippines, which boasts 3,000 free minutes to 60 countries and costs $14.99 per month for the first three months. The customer support from Vonage is a real jaw-dropper of a service due to its amazing versatility, from the live assistance to the varied additional support options. The live support provides all major contact methods, including live chat, email inquiry and phone support. Phone assistance is not available 24/7 – unlike chat messages and emails – but it is available every day, even in Spanish. 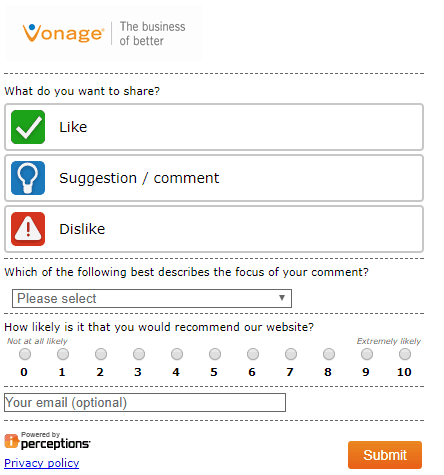 Whichever your preference, Vonage’s staff always answers to questions in a prompt and thorough manner. Additionally, Vonage users can contact the company via social media – Facebook and Twitter in particular since they are updated every two hours. 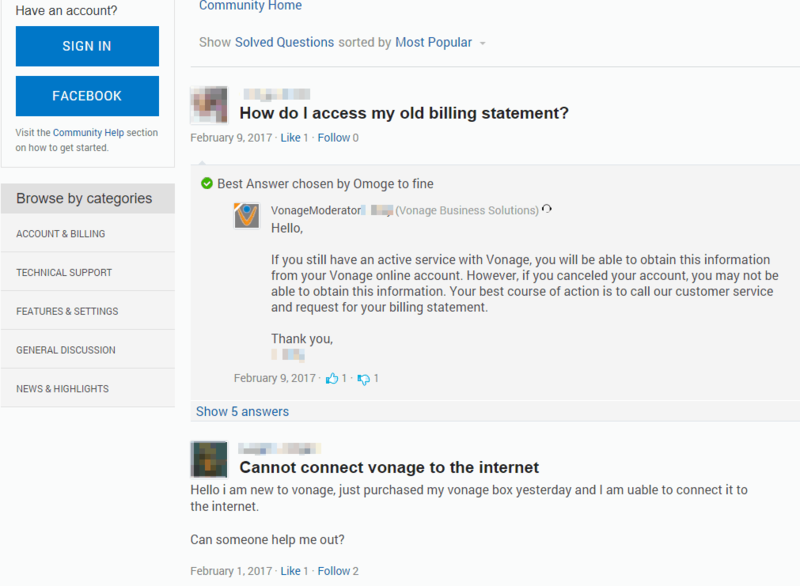 But there is more: Vonage maintains an extremely detailed help center alongside lengthy FAQs, both of which are full of various topics that should answer the most common questions regarding the use of any of the services. To top it all off, users can leave feedback about staff members or, better yet, interact with other users in the Vonage community via the forum. 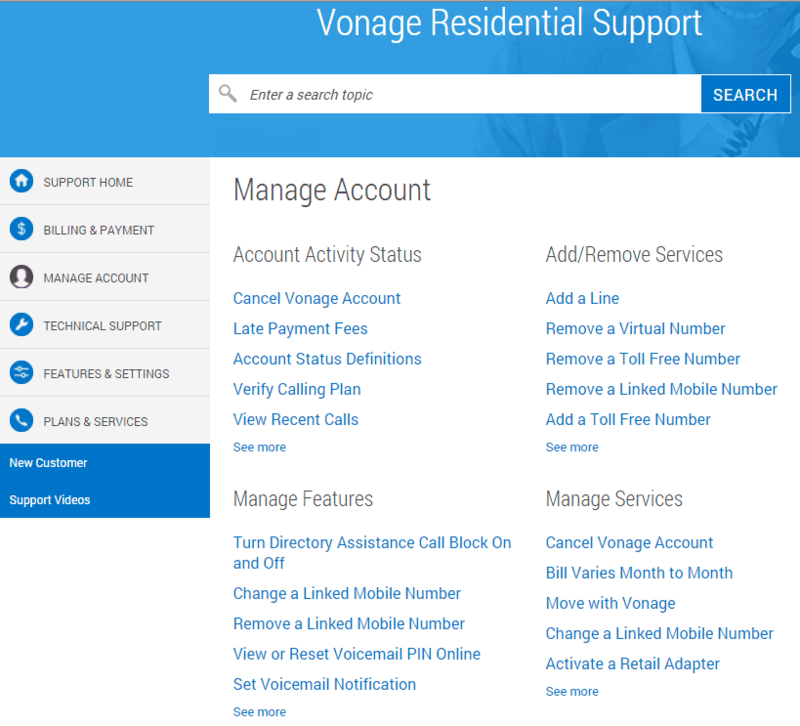 Vonage is the prime example of how to provide top-notch cloud phone services to residential users. The features that all Vonage subscriptions come with ensures that even residential users can enjoy the same treatment that small business clients might. To round out the package, Vonage throws clever extras into the mix, aspects like call hunt, the option to send and receive faxes, automated call return via the boomerang feature, and its two convenient mobile apps. Although subscriptions provide only one phone line, the system can handle as many additional phone lines as you like. And while Vonage’s system manager is a little lackluster, it is still simple and user-friendly and provides immediate access to every feature of the service from any regular desktop browser. All of these fantastic benefits come paired with a wide variety of pricing plans that offer reduced prices for the initial period and a handy risk-free trial available for the first 30 days.